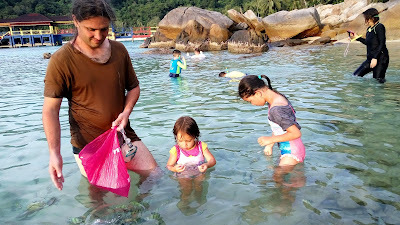 In Perhentian, we met a lot of French Muslims. They probably feel comfortable having beach vacations here as no one is going to tell them wearing burkini is a form of provocation to the society. 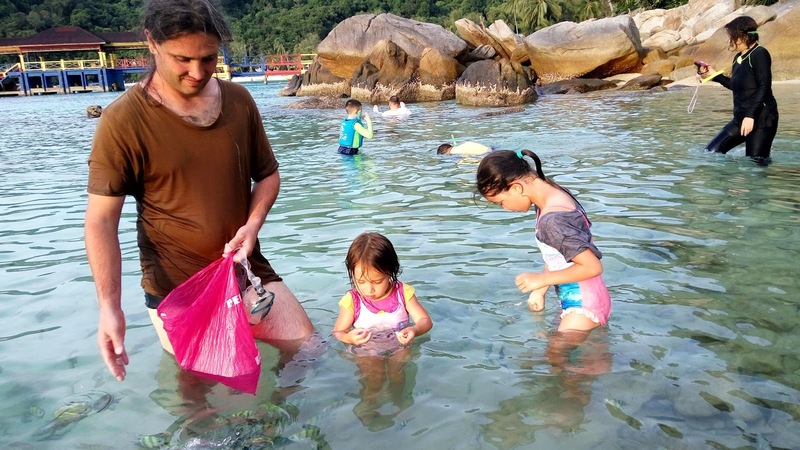 In perhentian, not only the Muslims are covered up. The Chinese from China too. I didn't dare to take a photo of them directly. Just checked out the photo above, the woman on the top right wore a black swimsuit that covered her whole body. Her kid in the middle wore the same type of swimsuit. In fact, my mother told me that my nieces and nephews also wear them. The only difference is they don't cover up their hair. I'm not sure if French are going to protest if Chinese tourists wear these showing in any French beaches. I grew up wearing T-Shirt to the beach, as we didn't use sunscreen. It could be the natural protection from sunburn. So covering is really not a big deal in the water, unless you want to show your body. That's not a "black swimsuit" but a wetsuit, like what divers and surfers would wear (pending on circumstances and water temperature, there are different types). Some people wear it because they're going diving/surfing but others wear it because it helps keep them buoyant as it acts like a lifebuoy (there's a bunch of physics behind it) so it essentially reassures them in a manner of speaking. Black bread is the new trend?